These suites are all located ground level at the front of the main building facing the sea. Some have a separate bedroom others have a dividing wall between the lounge and the sleeping area. They then also have a nice queen sized steel fold down sofa bed, which is very comfortable to sleep on. As the suites are large, just on 60 sq. meters, there is no problem accommodating 4 adults or Mum & Dad and the kids. The separate bathroom has colorful Spanish tiles and imported fixtures and fittings. 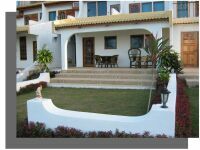 These suites have a terrace with furniture overlooking you own garden area. Just the place to relax in the afternoon and watch the kids play around. With the beach only 20 meters away and the restaurant even closer these suites are a great choice for guests.